alaTest has collected and analyzed 167 reviews of Philips A5-PRO. The average rating for this product is 4.5/5, compared to an average rating of 4.2/5 for other Headphones for all reviews. People are impressed by the design and price. The usability and sound also get good feedback, whereas some have doubts about the portability. We analyzed user and expert ratings, product age and more factors. 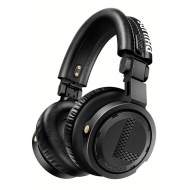 Compared to other Headphones the Philips A5-PRO is awarded an overall alaScore™ of 88/100 = Very good quality. Philips teamed up with musician Armin van Buuren to design its flagship headphone for DJs, and after several years of prototyping and testing, the A5 Pro over-ear DJ headphones are available to purchase for $300 (£250; AU$450). Tough build structure; includes two cables with smartphone controls and three detachable ear pads in varying sizes and materials; excellent sonic performance and passive noise attenuation. Heavier-than-average weight class might turn off listeners that are used to featherweight designs.